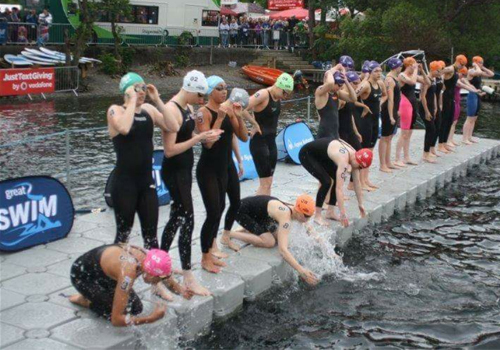 It had been a chaotic few weeks for Sophie, with 16 GCSE exams to be taken and a week of racing at the BEST Fest in Mallorca, but all of Sophie’s efforts proved very worth while and she was awarded a 3rd place finish in the Elite 5k at the Great North Swim – plus a TV interview afterwards – fame for Sophie! I woke around 8 a.m., to a slightly overcast morning by Lake Windermere, The Lake District. Before heading to breakfast, I made myself a TORQ shaker full of my Orange TORQ Energy, to start sipping throughout the morning. After my porridge and brown baguette, I walked down to the lake to register to swim in the 10a.m. 1 mile wave. I paddled the wave at a gentle speed, paying extra attention to the location of the buoys and the direction in which I needed to turn in my 5k race later that evening. The day consisted of plenty of relaxation, carb loading and hydration, as I ate ridiculous amounts of pasta and bread and regularly sipped on my electrolyted TORQ Energy drink. 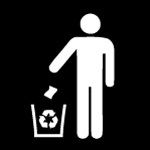 At 2p.m. we had our briefing, where the organizers and referees spoke about the course, numbering, and rules of the race. They dispatched our hats, mine was red and had the number 10 on the side as I was ranked 10th going into the race. 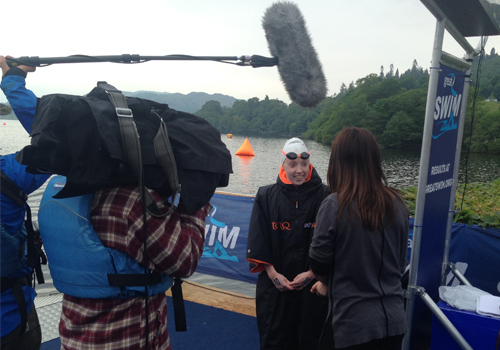 They also announced that the race would be a non wetsuit swim, as the water was now 17 degrees, which was just what I’d hoped for. At around 3p.m. I got into my racing suit and went downstairs to the Elite Athletes’ room, where I got numbered and spoke with my coach about my race tactics. 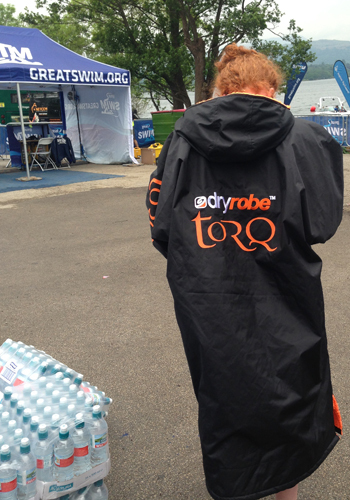 Shortly after that, I headed over to the start area in my Dryrobe to keep me warm – I Love my Dryrobe! A few minutes before we were scheduled to start, we were called down onto the pontoon, then the starter blew the horn and we were off. The start was a little messy, as always, but I got away pretty well (despite the freezing cold water) and found myself in a comfortable 6th or 7th position. The first lap went by and I kept myself comfortably in the mix, sitting on the leaders’ feet to conserve my energy. I remained constantly aware and prepared myself to react quickly to anyone who made a break off the front of the pack. During the second lap, I moved into 4th position. I was happy here, as I was able to stay out of trouble and follow the feet of Christine Jennings, who is one of America’s best Open Water swimmers. We were soon into the last 800m of the race, the 4 of us had broken away from the rest of the field and I knew I had a fair bit left to give at the end. I waited until we were into the last 400m before pushing the pace. Jennings broke away, but I was on her feet and felt strong. By the last 50m, Christine was in front and I found myself virtually entangled with Alice Dearing as we fought for 2nd place. As we got to the finish, Alice took the touch, but I was still very happy with 3rd place, in a field of many experienced International Open Water swimmers. From this result, I have qualified for the 2015 European Junior Championships in Tenero, Switzerland. I will be competing between the 10th and 12th of July and am hoping to stand on the podium again. Until then, it’s back to the grind. 3 weeks of very hard work to make sure I’m in the best shape possible. 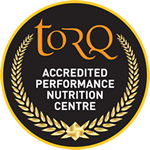 Lots of TORQ Energy will be needed! !